On Thursday, June 4 at 7:30 p.m. in Zankel Hall, the Carnegie Hall Notables present the Fifth Annual Notable Occasion, a musical evening hosted and exclusively underwritten by Nicola Bulgari, Vice-Chairman of BVLGARI and a Carnegie Hall Trustee. The evening includes a concert in Zankel Hall featuring works by Haydn and Shostakovich performed by members of Ensemble ACJW, the performance group of The Academy—a program of Carnegie Hall, The Juilliard School, and The Weill Music Institute in partnership with the New York City Department of Education. Immediately following the concert is an exclusive reception at Remi Restaurant. The Fifth Annual Notable Occasion is free for Notables members, Carnegie Hall's membership group for music enthusiasts in their 20s and 30s. For membership information, please call 212-903-9734 or email notables@carnegiehall.org. This evening is hosted and underwritten Nicola Bulgari. Steered by a diverse group of New York socialites and musical artists, the Notables Committee includes the following individuals: Carnegie Hall Notable Co-Chairs: Cody Franchetti and Jimmy Zankel; Executive Committee: Carrie Cloud, Lara Meiland-Shaw, and Mary Wible Vertin; Steering Committee: Mark Thomas Amadei, Wes Anderson, Joshua Bell, Fabiola Beracasa, Ryan Brown, Veronica Bulgari, Caroline Rocco Dennis, James Deutch, Jenny Sherman Dorman, Avner Dorman, Johnson Garrett, Seth Ginns, Brian Gorman, Audra McDonald, Shawn McDonald, Molly Morse, Christin Barringer Rueger, Vito Schnabel, Duncan Sheik, Gabriella Skirnick, Ferebee Taube, Justin Turkat, and Adam Wolfensohn. Since he began his viola studies at the age of 12, Brenton Caldwell has performed on three continents. Mr. Caldwell has appeared as a soloist with the Curtis and Banff chamber ensembles and the East Texas Symphony Orchestra. A dedicated chamber musician, he has performed alongside artists such as Roberto Díaz, Gary Graffman, Ida Kavafian, Menahem Pressler, and Steven Tenenbom. Festival appearances include Banff, Verbier, Angel Fire, Ravinia, Music@Menlo, Tanglewood, and the Amelia Island Chamber Music Festival. With an ardent devotion to education, Mr. Caldwell has participated in numerous outreach projects and served as teaching assistant to his longtime mentor Karen Tuttle. A native of Tyler, Texas, he is a graduate of the Cleveland and Curtis Institutes of Music. As part of his fellowship program, Mr. Caldwell teaches in Queens at PS 62. Cellist Nicholas Canellakis has performed across the US and throughout Europe. He has also appeared at the festivals of Santa Fe, Ravinia, Music@Menlo, Sarasota, Verbier, Aspen, and Music from Angel Fire. Mr. Canellakis has performed in such venues as Alice Tully Hall, Kennedy Center, Jordan Hall, and Disney Hall. Mr. Canellakis is a founding member of the Vertigo String Quartet, which received First Prize in the 2006 Musicatri International Competition in Italy. 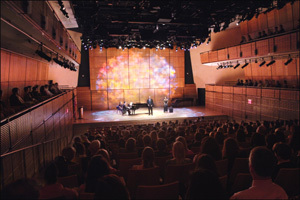 The Quartet made its New York debut on the New School concert series in February 2008. Mr. Canellakis graduated from the Curtis Institute of Music where he studied with Orlando Cole and Peter Wiley and was principal cellist of the Curtis Symphony Orchestra. He holds a master’s degree from the New England Conservatory where he worked with Paul Katz and was the recipient of the Gregor Piatigorsky Award. Mr. Canellakis appeared in the recent documentary about the life of Gustav Mahler, A Wayfarer’s Journey. As part of his fellowship program, he teaches in the Bronx at PS 198X. Violinist Angelia Cho was born in South Carolina, and began to study violin at age three. She made her debut with The Philadelphia Orchestra at age 11 at the Mann Music Center, and performed with the orchestra again at the Academy of Music three years later. Ms. Cho graduated from The Curtis Institute of Music in 2002 and completed her graduate studies with Donald Weilerstein at the New England Conservatory. She has appeared as soloist with ensembles including the Pittsburgh Youth Symphony, Israel Kibbutz Orchestra, and Allegro Society under such conductors as Mark Laycock, Daniel Meyer, Luis Biava, Shlomo Mintz, and David Lobel. Ms. Cho has attended master classes in Israel and at the International Musicians Seminar in Prussia Cove, England; has performed at the Sarasota, Verbier, and Yellow Barn festivals; and is a first-prize winner at the National Society of Arts and letters Violin Competition. As part of her fellowship program, she teaches in the Bronx at PS 30. Violinist Joanna Marie Frankel is the 2007 recipient of the Rachel Elizabeth Barton Foundation Career Grant and The Juilliard School's William Schuman Prize for artistic excellence. She has performed as a soloist, recitalist, and chamber musician throughout the US and abroad, and has future engagements with orchestras in Tennessee and Michigan. Ms. Frankel recently appeared at La Jolla's SummerFest and finished a tour in Central and Eastern Europe, performing at such venues as Amsterdam's Concertgebouw. In 2007 she made her Carnegie Hall recital debut, and joined the Concert Artist Faculty at Kean University in violin and viola in 2008. Ms. Frankel has collaborated with Jascha Brodsky, CJ Chang, Robert Chen, Masao Kawasaki, Joseph Kalichstein, and Cho-Liang Lin. As part of her fellowship program, she teaches in Queens at PS 63. Ukrainian pianist Angelina Gadeliya has performed throughout the US, Canada, France, Italy, Spain, and Ukraine. She has appeared as a soloist with the Stony Brook Symphony Orchestra, Fort Worth Symphony, Sinfonia of Colorado, Oberlin Chamber Orchestra, and the South Dakota Symphony, and has performed at Alice Tully Hall, the New York Historical Society, Banff Centre for the Arts, and the Ukrainian Institute of Modern Art in Chicago. Twice a fellow at the Tanglewood Music Center, Ms. Gadeliya was invited to perform as part of the Emerson String Quartet’s Beethoven Project in Weill Recital Hall in 2007. A graduate of the Oberlin Conservatory of Music, The Juilliard School, and Mannes College The New School For Music, Ms. Gadeliya is currently pursuing her Doctor of Musical Arts degree at SUNY-Stony Brook under the tutelage of Gilbert Kalish. As part of her fellowship program, she teaches in Brooklyn at PS 130. Ensemble ACJW is the performing group of The Academy—a program of Carnegie Hall, The Juilliard School, and The Weill Music Institute in partnership with the New York City Department of Education. The Academy is a two-year fellowship that provides the finest post-graduate musicians embarking on their careers with performance opportunities at Carnegie Hall, Juilliard, and other venues in New York City and New York State, advanced musical training including coaching sessions with top musicians, intensive teaching instruction, and the skills and values necessary for careers that combine musical excellence with education, community engagement, and advocacy. Fellows work in partnership with a specific New York City public school music teacher in a variety of grade levels in areas such as interactive performance, instrumental teaching, creative learning projects, and general music knowledge, depending on the specific needs of each school. A partnership with Skidmore College that began in the 2007–08 season also brings performances and educational events to the Saratoga Springs community. The Carnegie Hall Notables is a membership group specifically created for music enthusiasts in their 20s and 30s. The Notables program celebrates music through intimate discussions with world-famous composers and musicians, concerts, private performances, and exclusive Notables-only social gatherings throughout New York City. Members are given access to experience all types of music—both traditional and contemporary. Contributions to the Notables support the vital music education programs of The Weill Music Institute at Carnegie Hall, which annually serves over 115,000 children, students, teachers, parents, young music professionals, and adults in the New York City metropolitan area, across the United States, and around the world. www.carnegiehall.org/notables.